After returning from a trip, my son now 18, greeted me wearing this hat. This picture reminds me of how society objectifies women. It may happen unconsciously, but regardless it happens. 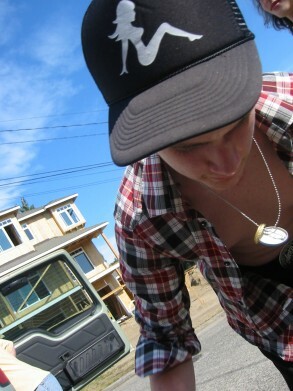 In this case I raised this boy to think it was ok to wear images of women as sexual objects. Interestingly this image is commonly seen on the mud flaps of trucks. Pause for a moment to absorb the symbolism, this image is placed on a vehicle where mud and road dirt are spewed at it. I couldn’t make up anything as quintessentially disrespectful as this if I tried. Don’t get me wrong, I love my son with all my heart, I just didn’t care for some of his younger behaviors, reminding myself- I raised this boy. 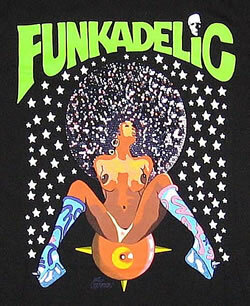 There was also period of time when too often I would see him he was wearing a t-shirt with this funkadelic image. When I saw it I would cringe. I wanted to throw rocks at him. I tried to explain how vulnerable that position is for a woman. He thought the image was cool. I think he had a sophomoric perspective. Today there are still countries where women don’t have the right to vote, and sections of our society that ask women to submit to their husbands. Back in the day, I was not raised with an overt oppression to be submissive. It didn’t matter; the cultural expectation was there. I remember in junior high hearing I was a nominee for class clown. I was mortified thinking girls weren’t supposed to be funny; they’re supposed to be demure and submissive. Ingrained in me was the collective unconsciousness from hundreds/thousands of years of bad behavior. I often think of what I could have done differently to have discouraged this. I wonder what girls today think? In 2009 Jimmy Carter wrote an article “Losing my religion for equality”. The article describes his struggle and brake from the Southern Baptist church in support of human rights and equality. Go Jimmy!